Check out these really helpful tips on how to get gorgeous plump lips. So, what are you waiting for? Try out these makeup tips if your lips are thin or uneven and smile away to glory. Not all of us are blessed with evenly shaped plump lips that we most often find on magazine covers. If a thin, uneven and ill-shaped lip is your concern area like majority of women, then we recommend you follow the makeup advice below. Makeup serves as a great solution for people who aren’t born with full and evenly shaped lips. Know that painful collagen lip fillers and augmentation methods are not always necessary to get that desired shape and pout. Instead, more importantly, getting a few corrective makeup techniques and tips right is the key so that your lips look always beautiful. Thin lips: Make your lips appear fuller and accentuate their shape by using a lip liner. Outline the edge just along the natural lip line. Apply small dots outside the edge of your natural lip line and then carefully draw a straight line. Select a lip liner that is only one shade darker than your lipstick color. This will serve as a guide while you fill in lipstick and will prevent the color from bleeding. To get extra fullness, we recommend using a brush to fill lipstick. A brush gives you more control and accuracy to fill in color as compared to a lipstick. Start from the corner of your mouth and fill in color to the middle part. Another important tip to create an illusion of plumper lips is to use creamier colors that fill in lines on the lips or glossy colors instead of matte colors. These days, you may also find lip plumper glosses in the market. 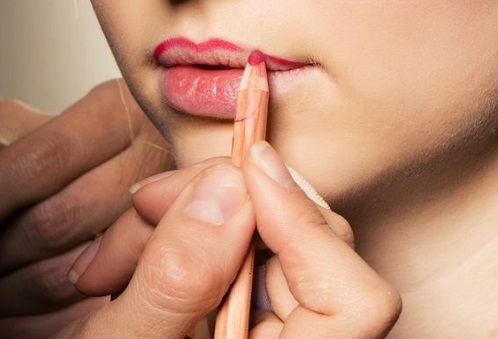 Uneven lips: Balance the shape of your lips by outlining the thin part by a lip liner. By using the natural shape of the plumper part of the lips as a guide, outline the lips just outside the thinner part. Once you are done, take a step back and have a look at the lines to make sure that they are even from both sides. Now, follow the steps described above to fill in lipstick by using a brush. An important tip that works well for uneven lips is using a lipstick shade that blends well with your natural skin tone. In the end, if you feel that your lips still look uneven then try to add more color to the thinner part for a plumper and even shape. Shapeless lips: With the absence of a proper shape, you will have to work your way to create a natural shape. For top lip, start with the ‘m’ or also known as ‘cupid’s bow’ in the middle and create a line on each side by using a lip liner. Once you are done, make sure that you have created even lines on each side and that they appear curved for a natural shape. For bottom lip, start outlining the middle part just outside the edge by creating a soft curved line. Extend the line on each side to the edge of the mouth to complete the lip shape. 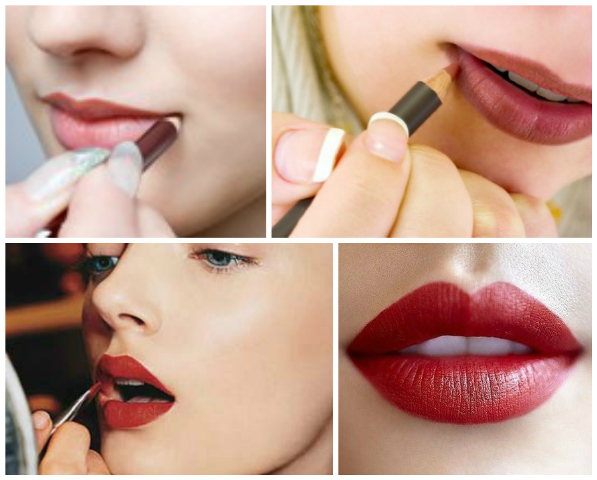 An important tip to remember while choosing an appropriate lip color is to select a dark shade of lipstick. Strong shades will help to define a proper shape. Before applying lip makeup, gently exfoliate and hydrate your lips. This will ensure that your lip liner glides easily and will prevent the lipstick from bleeding. Also, select lipsticks that hydrate your lips. 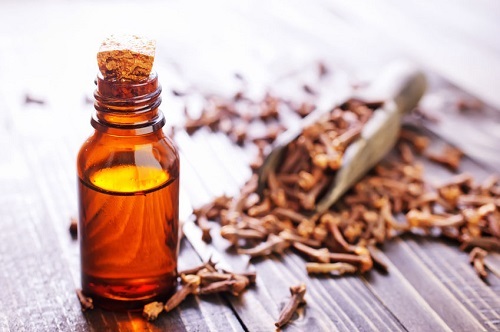 Some of the natural ingredients that act as a natural plumping agent include menthol, clove oil and, cinnamon and honey mix. You can either directly use these on your lips or use products that comprise these ingredients. If they do not cause any irritation on the skin then you can apply them a few times on your lips.